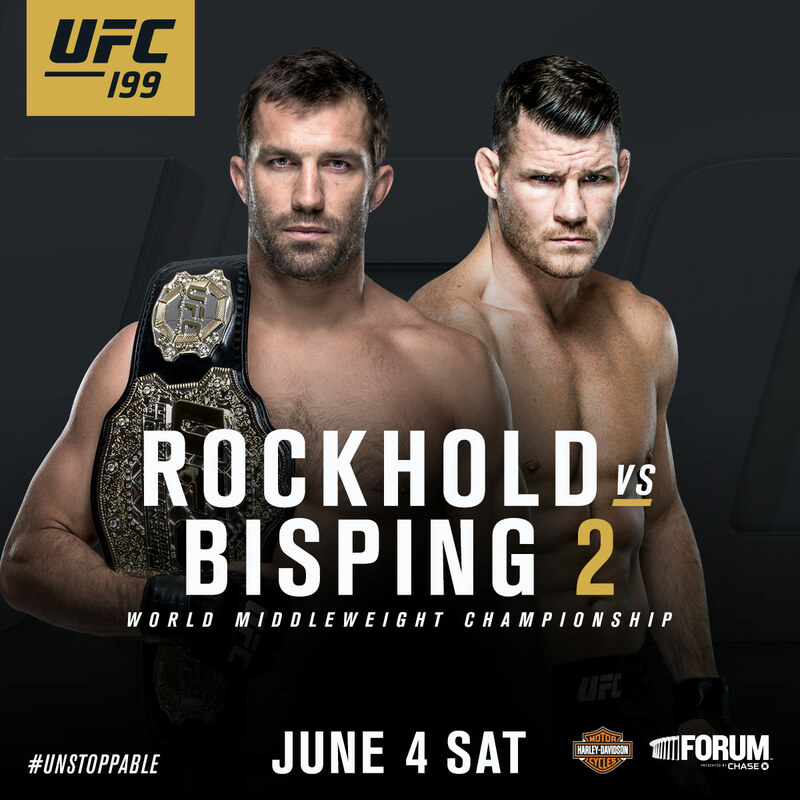 UFC 199: Luke Rockhold vs Michael Bisping 2 Fight Pick & Preview | MMA Fighting Events Videos Techniques UFC Fight Picks and News. The main event at UFC 199 changed a few weeks ago, but, it might even be better now! Michael Bisping is stepping in for the injured Chris Weidman to take on the champion Luke Rockhold. Bisping can go toe to toe with anyone as his recent victory over MMA legend and former UFC champion Anderson Silva clearly proved! Let’s take a closer look at these fighters and then I’ll make my UFC main event fight pick for UFC 199: Luke Rockhold vs. Michael Lisping 2. Luke Rockhold is coming into this UFC middleweight title defense with an overall MMA record of 15-2. He hasn’t lost a fight since 2013 when he was KO’ed by Vitor Belfort. Keep in mind, back then, Vitor was using TRT and hasn’t been the same since the UFC adopted stricter PED (performance enhancing drug) testing procedures. 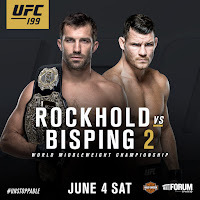 Rockhold rose to the UFC throne by defeating some of the best in the middleweight division, including wins over MMA great Lyoto Machida, and former champion Chris Weidman. Michael Bisping is a UFC veteran. He’s not going to be raddled by the bright lights and huge crowds. Bisping has faced some of the best fighters in MMA and has racked up an overall MMA record of 28-7. Bisping is on a three fight winning streak that culminated in a win over Anderson Silva. Michael Bisping likes to stand and brings in a full gas tank to every fight. He’s shown that he can go all five rounds and win as his last two fights have proven. While he hasn’t shown much KO/TKO power recently, he does have 15 KO/TKO’s on his resume. He had 4 submission victories early in his career, but now he’s more of a sprawl and brawl fighter. 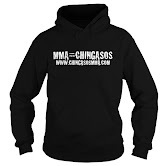 He uses the ground game defensively and to get the fight standing where he’s most effective. Luke Rockhold is a huge favorite in this rematch. He already has a win over Bisping. He’s bigger. He’s stronger. He’s younger. His wrestling is better. His submission game is better. He had a full camp. On paper, the winner of this fight should be easy to pick. With all that being said, I’m picking Bisping for the win. Why? Well, for two reasons. One, this is probably Bisping’s last shot at a UFC title and I have a feeling he’s going to bring his A game plus a sense of urgency. Two, there seems to be cloud of weird and whacky hovering over the UFC’s middleweight division. The weird and whacky started with Chris Weidman knocking out Silva. Then, in the rematch, Silva breaks his leg. And, just as Weidman is proving to the world that his championship was no fluke, in his title defense agains Luke Rockhold, he attempts a fancy wheel kick late in a close fight, misses, falls and seemingly gift wrapped the championship for Rockhold. Rockhold pounced on Weidman and eventually finishes him off. Look for Bisping to stay on the outside and strategically but possibly boringly drag the fight into the later rounds. Rockhold has only gone past the second round three times. The later rounds is where Bisping’s gas tank and experience will give him an advantage. He’ll look to avoid Rockhold’s big chingasos and land some peppering shots in an effort to win rounds and take the decision victory. Am I crazy for picking Bisping? Or, will the weird and whacky in the UFC’s middleweight division continue?